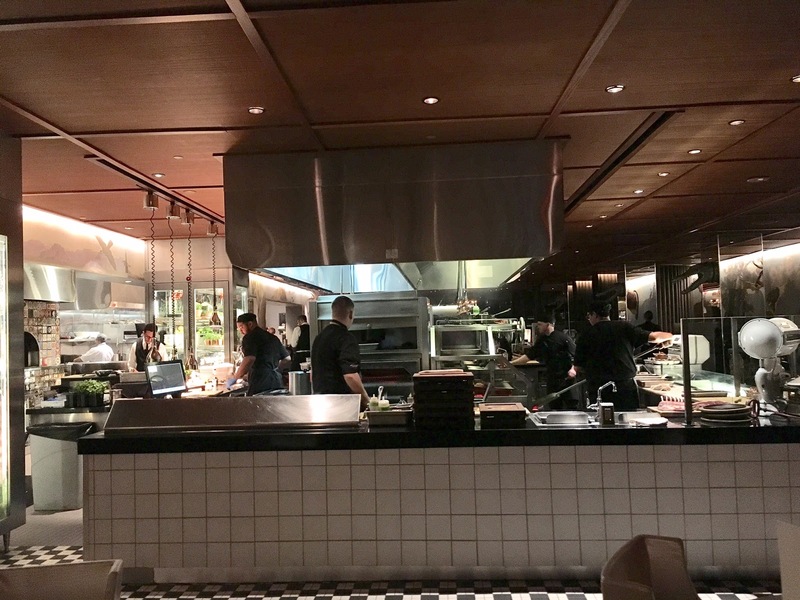 I've been to the Bazaar here in Los Angeles and the place is actually pretty darn good. 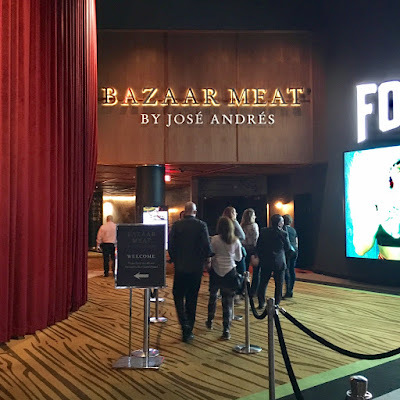 So when I heard that there was a Bazaar Meat in Las Vegas, I knew I had to try it. COURSE ONE: SUPER GIANT PORK SKIN CHICHARRON: Greek Yogurt, Za'atar Spices. I mean, who doesn't love chicharron?! I thought this was delicious but a tad bit over-seasoned. Don't get me wrong, I love salt but too much salt overpowers everything. At least the Greek yogurt helped mellow out the salt. 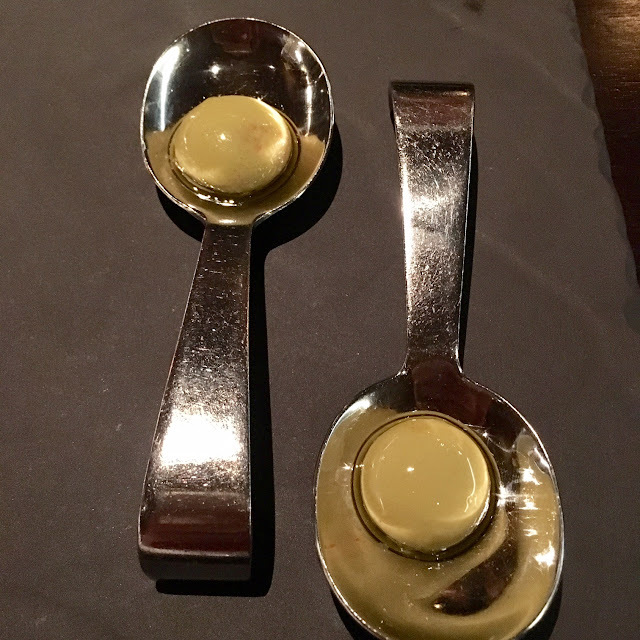 COURSE TWO: FERRAN ADRIA OLIVES, MODERN AND TRADITIONAL. 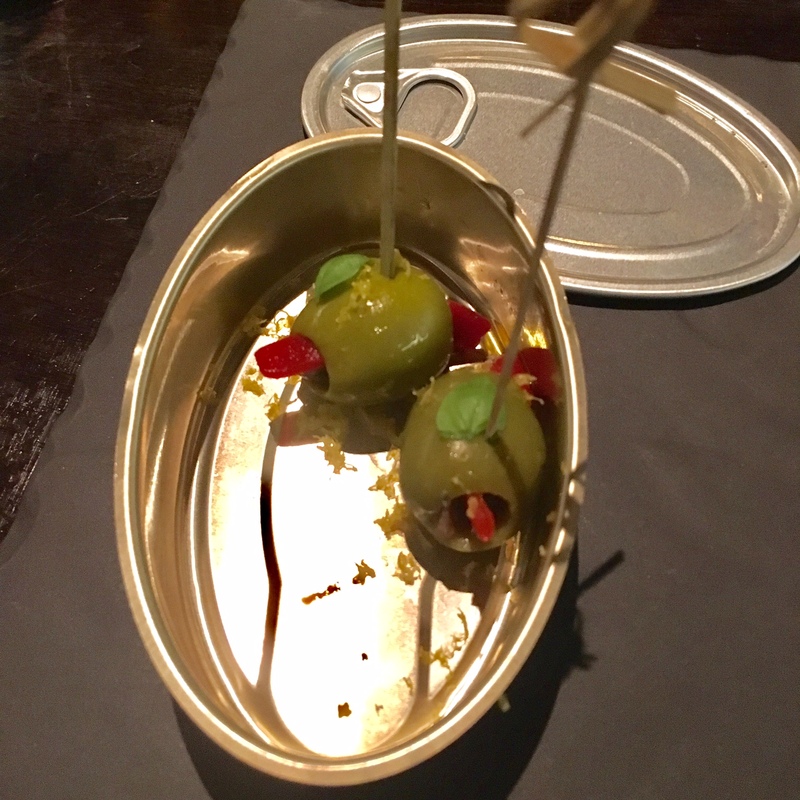 Gordal Olives Stuffed with Piquillo Pepper and Anchovy. This was a good olive dish. I thought it was pretty simple, so nothing too special about it. COURSE TWO: FERRAN ADRIA OLIVES, MODERN AND TRADITIONAL: Liquid Green Olives. 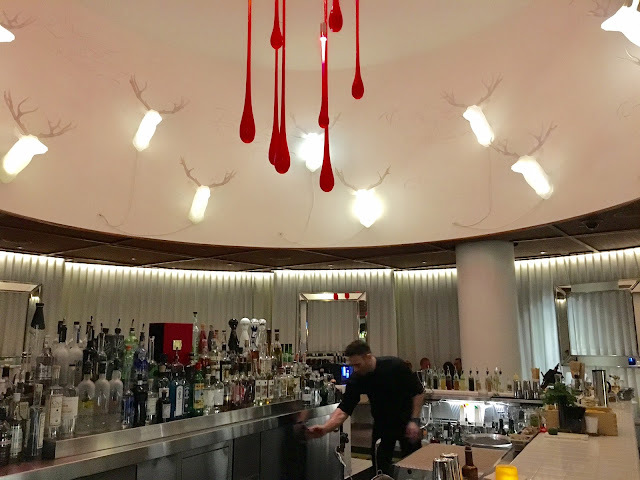 This is molecular gastronomy at its best. Imagine a big popping boba but with olives instead. This is what you get. It was good, complicated and interesting. You can get these at the Los Angeles location. 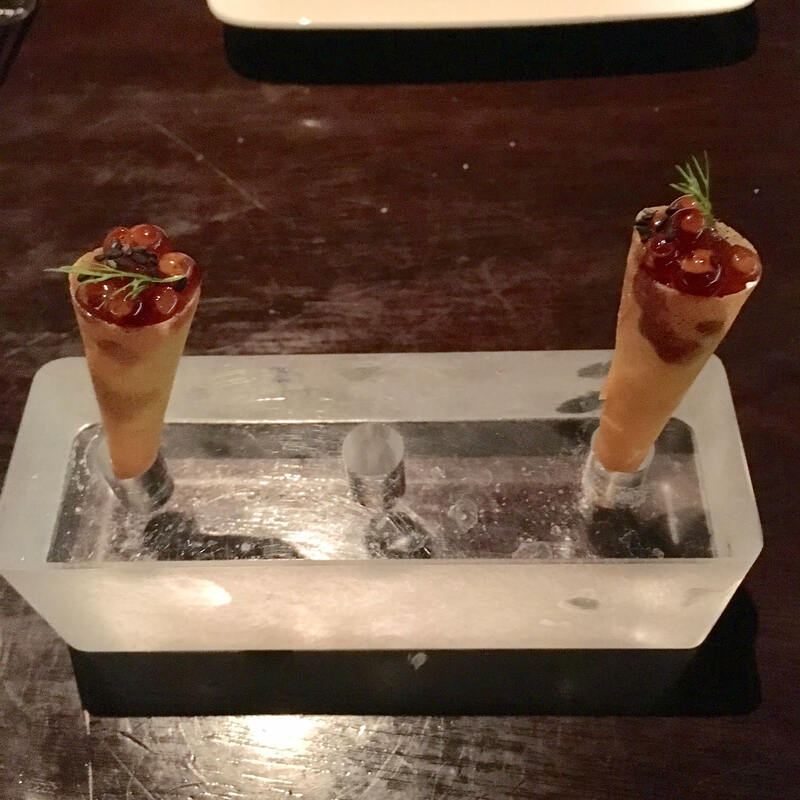 COURSE THREE: BAGEL AND LOX CONE: Dill Cream Cheese, Salmon Roe. This was probably my least favorite dish out of all the courses. Don't get me wrong, it was tasty but it was a little too fishy for my liking. The cone itself was deliciously crunchy. 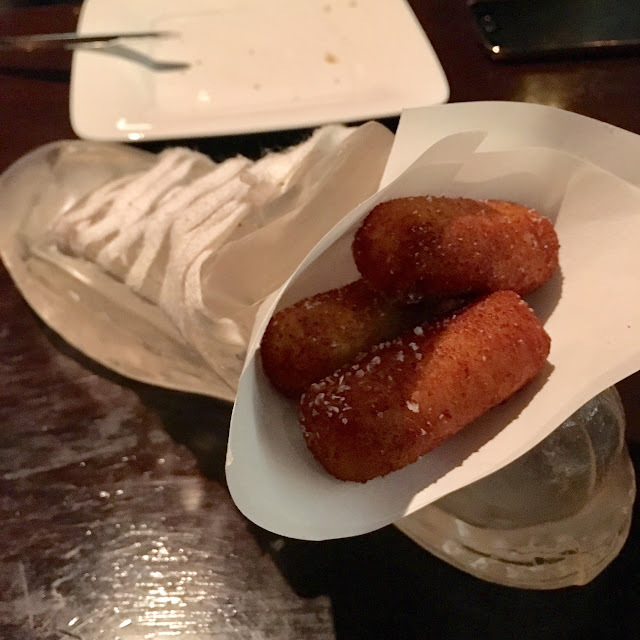 COURSE FOUR: CROQUETAS DE POLLO: Chicken-Bechamel Fritters. This was one of my favorites. I loved the exterior being super crispy. Inside, it was warm creamy goodness that was perfectly balanced. And who doesn't love the presentation in a glass shoe? COURSE FIVE: BEEF AND PARMESAN GRISSINI: Washagyu Beef, Espuma, Caramelized Onion Puree. I loved this dish as well. 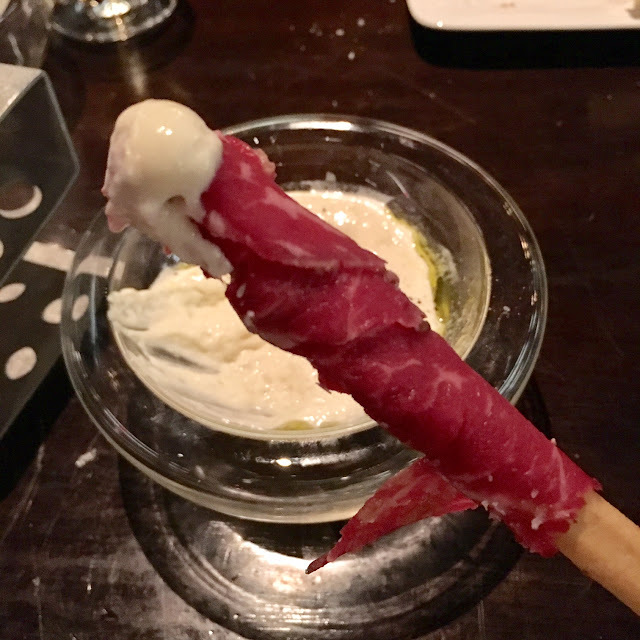 It was a crispy breadstick wrapped with some beef carpaccio. 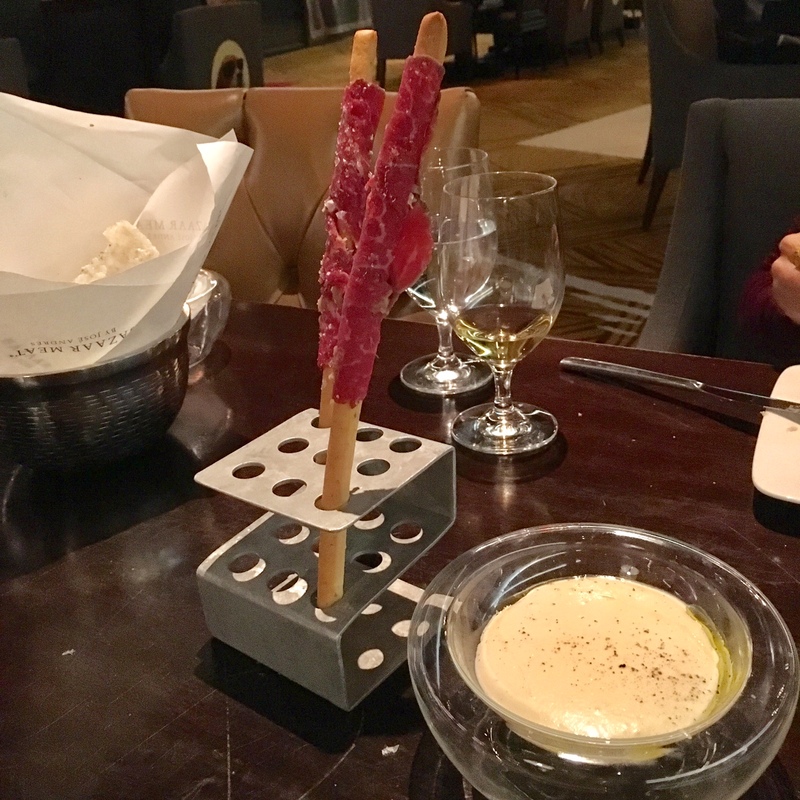 I thought it was a little salty but with the sauce, which is similar to the sauce provided with the chicharonne, it mellowed things out. MY FAVORITE DISH. COURSE SIX: CHATEAUBRIAND, TENDERLOIN, BRNADT BEEF, CA, HOLSTEIN: Perigord Sauce, Pomme Souffle. 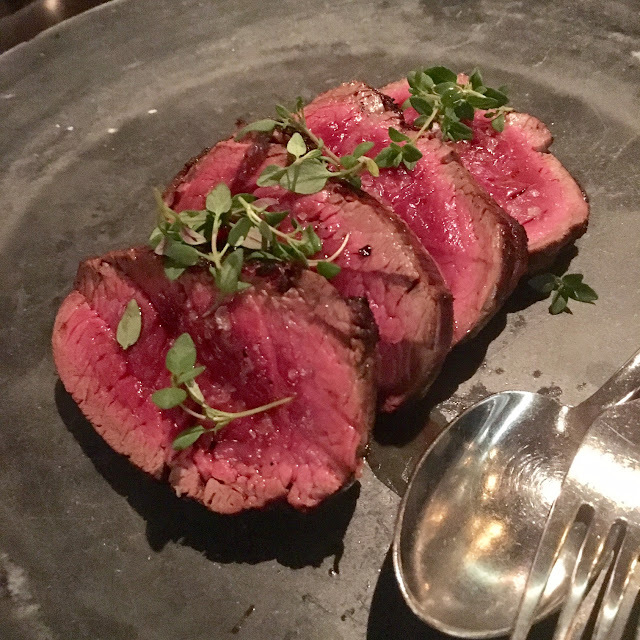 How can you not love this beautiful delicate piece of steak?! It's extremely moist and full of flavor. I loved that it was more on the rare side because I feel it packs in more flavor of the meat. It came with a sauce but it was actually good as is. COURSE SEVEN: ROBOUCHON POTOATOES: Butter, butter, more butter, Some potatoes. 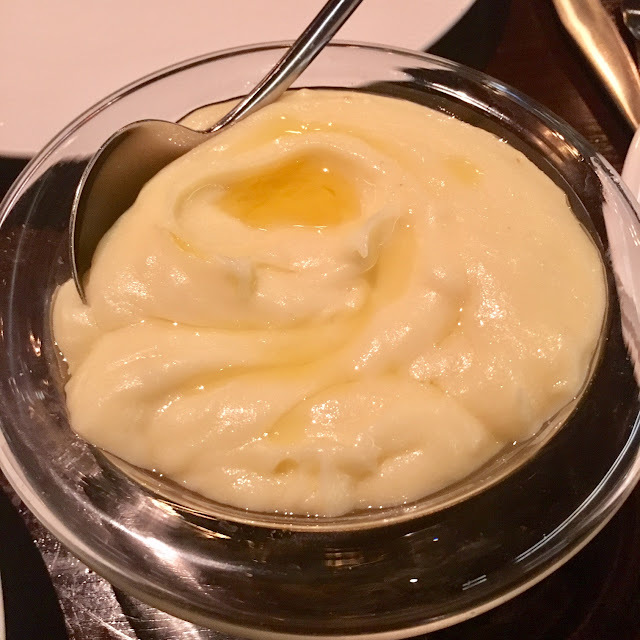 If you love butter and mashed potatoes, this is the dish for you. It is freakin a butter load on a few potatoes. It was rich and creamy and you can probably only have a small amount. I loved it. COURSE EIGHT: GRILLED ASPARAGUS: Romesco Sauce. I loved the asparagus. It was nice and tender with a slight crisp to them. The romesco sauce was just ok for me. I prefer if it had more of a tomato sauce to it. 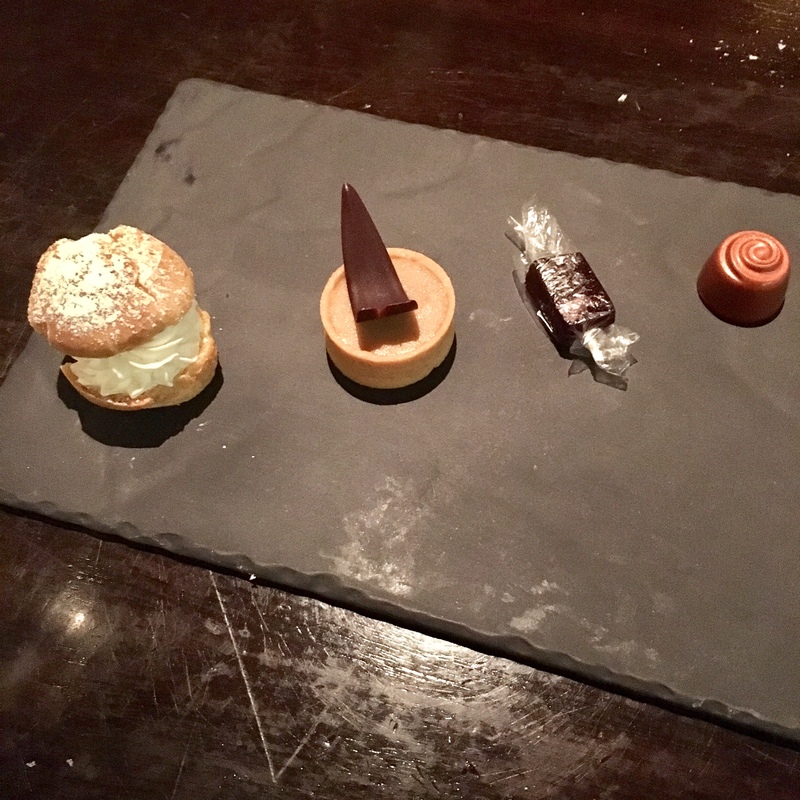 COURSE NINE: DESSERTS: Cream Puffs, Assorted Tarts, Little Cakes. I thought the desserts were delicious. I didn't think that there were any cakes, which I was disappointed about since it was listed on the menu. The tart was one of my favorites. The only thing is, you have to cut it in half and share it with another person. You don't get your own one, which I thought was kinda hard to do. Seriously, at this point it was a huge deal breaker since I was full by then. Overall, I thought Bazaar Meats was pretty darn good. 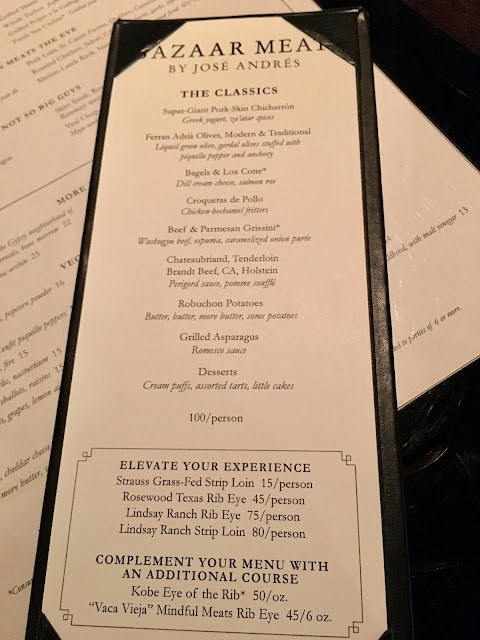 I appreciated that there was a prix fixe menu because the menu was fairly large which can be a bit overwhelming. I was able to try the dishes I wanted to try. The service was pretty good. I didn't like that we had to wait well beyond our reservation and they were about to seat walk-ins who came in after us. Other than that, this is a good option if you want to dine a bit off the strip.